Knoll’s idea for Rogue One was borne from contemplating the opening crawls of the Star Wars films. The text for the original trilogy which had been painstakingly shot on film with a camera dolly system; the monumental crawls for the prequel trilogy were personally made by him, entirely digitally, on his own computer. “Just a fun project to tackle,” he says .) But this got him thinking about those never-seen covert spies, Knoll began conceiving of a story that, compared to the sprawling space opera of the trilogy films, would be fast, focused, gritty and jam-packed with the ‘WAR’ in Star Wars. Who wouldn’t be inspired by this opening sequence as it starts after a thunderous Twentieth Century Fox fanfare and Lucasfilm logo, the movie then begins with a phrase suitable for any tale of Good Vs Evil: ”A long time ago…” The Lucasfilm text was tinted light blue in order to make the subsequent main title reveal all the more dramatic. Fade out and let the magic begin. Composer John Williams’ triumphant overture blasts the title card into frame and off to infinity as the crawl rolls into view…Rebel spaceships, striking from a hidden base, have won their first victory against the evil Galactic Empire. War drums echo through the heavens as a roll up slowly crawls into infinity. The typography was inspired by sci-fi serials like Buck Rogers, highlighting certain names and places in all caps to emphasize their importance to the narrative. Like the rest of the Lucas’s script, this text went through countless iterations before it could be put to film. 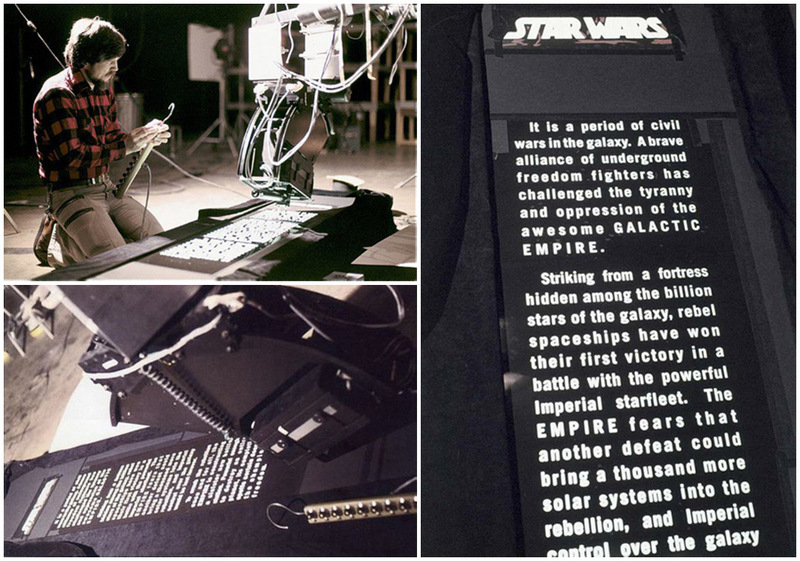 Fox initially opposed the idea of an opening crawl altogether, suggesting that a narrator could convey the same information more effectively, but the studio relented after Lucas’s friend, filmmaker Brian De Palma, helped the writer/director rewrite and streamline the clunky exposition. But lets not forget that oh-so-recognizable Star Wars logo? The classic branding loomed large not just in the film’s opening titles, but on posters, t-shirts, lunch boxes, and every imaginable type of merchandise. Designed by artist Suzy Rice under the direction of Lucas, the logotype was then adapted for use in the opening. Rice’s logo design, originally created for the film’s studio presentation brochure and other print materials, was ultimately chosen for the movie’s main title sequence after being revised by ILM’s Joe Johnston. 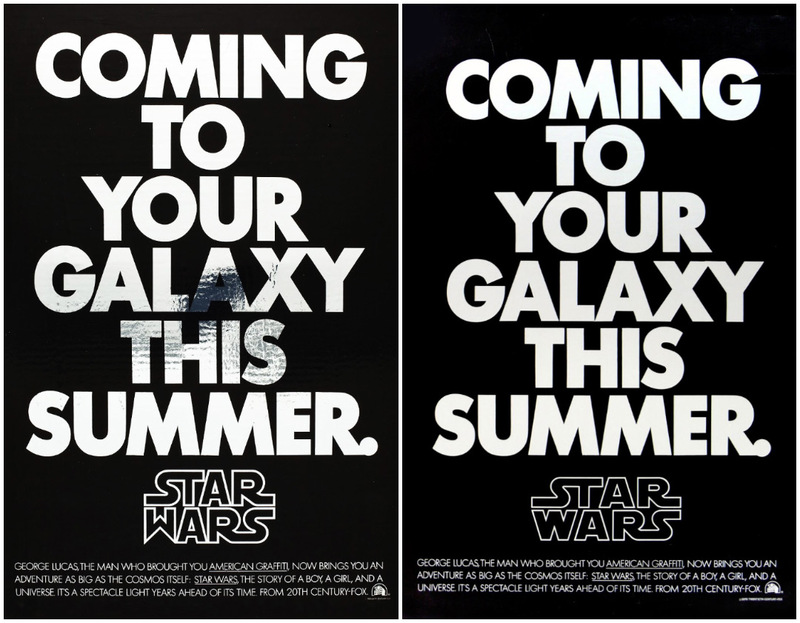 After Star Wars hit theatres though, Rice’s logo design became standard on nearly all merchandise and marketing materials. All these elements combined for us fans experiencing those opening moments of Star Wars was like finding a key in our childhood, unlocking a hidden door to our future creativity and what can be achieved. But beyond all my Star Wars nostalgia, beyond all the hype, that original Star Wars opening is quite simply great filmmaking. It’s a potent combination of music, typography, and sheer cinematic scale. As awesome as those screen-sized titles first appear, they are quickly dwarfed — both on-screen and in our imaginations — by the galaxy that was about to unfold, both then and now with Rogue One. 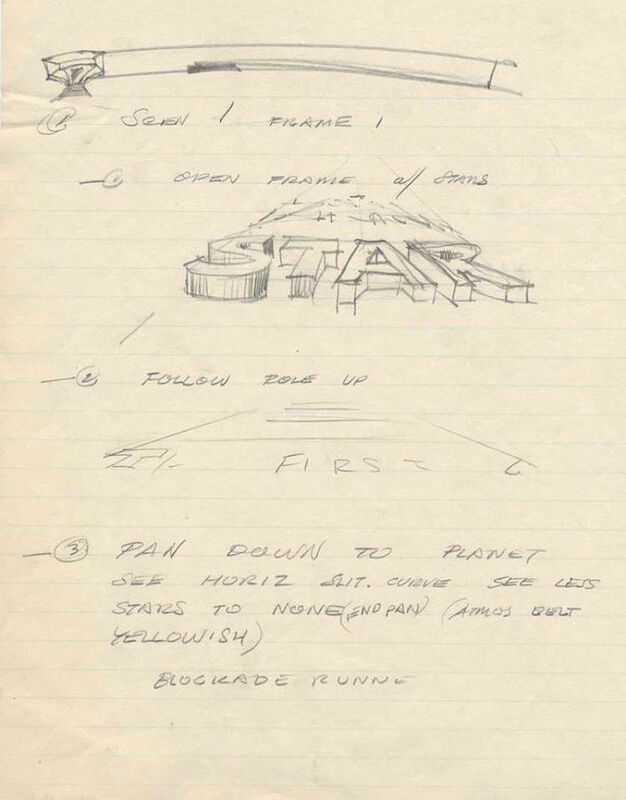 Suzy Rice’s original Star Wars logo design. Post inspired by Dan Perri’s book on his career in title design and Suzy Rice’s work on Star Wars THE “STAR WARS” LOGO DESIGN. That ‘Union Pacific’ clip is incredible, I never knew there was an inspiration for the crawl, though I suppose it should be obvious since so much of it was inspired by classic serial shorts.